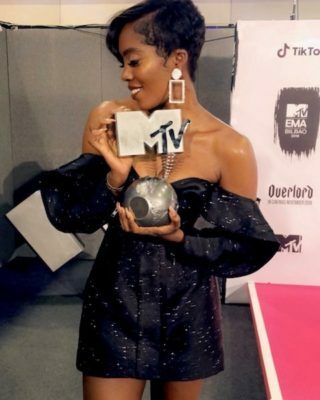 Congratulations to the number one African bad girl, Tiwa Savage as she bags the award for best African artistes at the MTV Base EMA awards which was held last night. Tiwa savage was voted ahead of Davido and some other African artistes. This is definitely a big deal for the Nigerian music industry. Tiwa Savage, who becomes the first female artist to achieve this honour was present on stage to receive her award which she dedicated to her son, Jamil and her fans.